It was a beautiful spring day for the PVM Open House on Saturday, April 8. 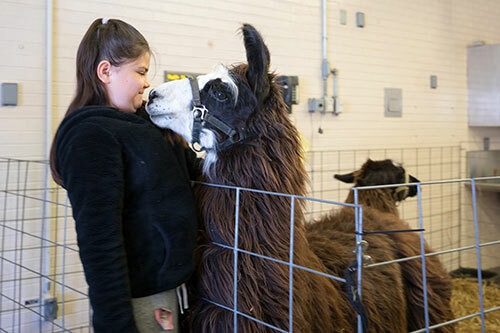 The annual event coincides with Purdue’s Spring Fest each year to promote education of all the different unique aspects of veterinary medicine. This year’s theme, “The Key to a Healthy Animal is as Easy as Pie”, helped inform guests on the steps to maintain the health and wellness of all animals through preventive medicine. Lynn Hall was packed with families throughout the day looking to learn more about veterinary medicine in a fun and exciting way. Attendees were guided through the chambers of the heart by first-year DVM students in the “Walk Through the Heart” station and took a closer look at the digestive system in the “Walk Through the GI Tract” exhibit with second-year DVM students. 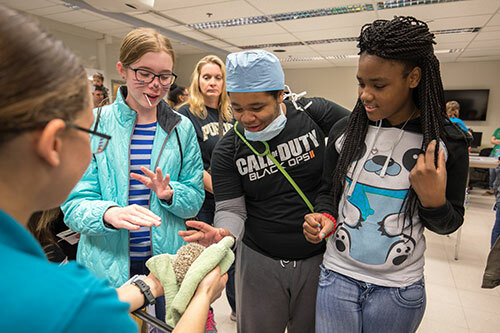 Crowd favorites returned once again this year including the Teddy Bear Suture Clinic, in which children scrubbed in as surgeons and prepared to heal “injured” teddy bears. Also returning this year were the Equine Treadmill Demonstrations, allowing visitors to view the specialty treadmill in action which is used to diagnose serious issues such as lameness, respiratory, and cardiovascular issues in horses. 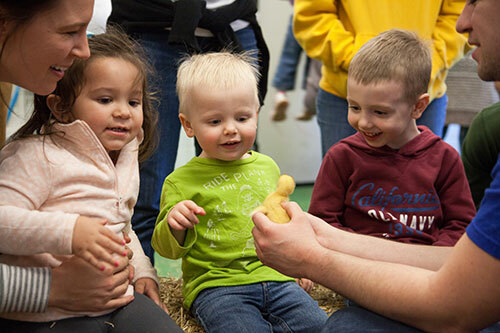 Attendees learned about rumen physiology from Buttercup the Fistulated Cow and hopped over to the petting zoo to rub noses with llamas, hold baby chicks and ducklings, pet bunnies and mini donkeys, and check out the painted horse, cow and goats. Indoors, a mini exotics petting zoo was provided by the Columbian Park Zoo of Lafayette that had all sorts of critters on-hand, including a python snake, lizard, treefrog, spikey hedgehog, and even hissing cockroaches. The Indianapolis Zoo also took part in the Open House by sharing a small collection of exotic animal x-rays and skulls. Open House-goers took the opportunity to recharge in the Open House food tent where they could purchase food and drinks in support of the Food Animal and Equine Clubs. Brand new this year was the Vet Tech Dunk Tank! Despite the techs’ best efforts, it was difficult to thwart the kids’ enthusiasm at winding up a throw or two or three to hit the bullseye sending the veterinary technicians into the tank with a splash, all while learning a technician’s role in veterinary medicine. 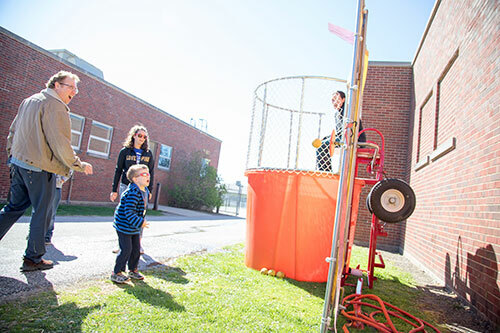 The dunk tank was a success raising $193 in donations for the Purdue Veterinary Technology Student Association (PVTSA) with an additional $80 in donations at the face painting station. Weather permitting plans are underway to make the tank an annual event! Some of the sights and sounds of the Open House were captured on Saturday. Click here to view the video. Click here to view more photos on the PVM Facebook page. A little slugger takes his shot dunking PVM Veterinary Technologist Molly Cripe-Birt at the Dunk Tank station during the PVM Open House on Saturday, April 8. The petting zoo was a favorite for kids and adults alike. Did you know llamas say hello by rubbing noses? Visitors received happy greetings at the petting zoo. The Columbian Park Zoo was on-hand for a mini-zoo, including this spikey hedgehog. 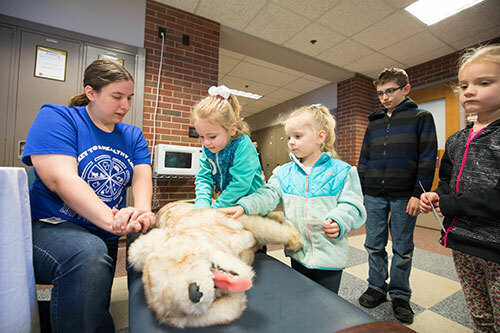 Veterinarians-in-training practiced CPR on dummy dogs with the help of student instructors.